The amenities at this exclusive Jamaican resort were designed with the highest standards of hospitality in mind. Our warm and professional staff are on hand around the clock to ensure that your Jamaican vacation is truly memorable. Comprehensive in scope and exquisite in execution—all with a friendly, laid-back attitude—the amenities and services at Round Hill Hotel and Villas have made this Caribbean resort a leading destination for decades. With water sports, tennis, the Tryall Golf Club, spa services, a fitness center, wedding and event services, dining, and shopping available day and night, you won't find a more perfect Jamaican resort experience than at Round Hill Hotel and Villas. Photo copyright Round Hill Hotel & Villas. Round Hill Hotel and Villas has long been the most beautiful and elegant boutique resort in the Caribbean, known for understated glamour, discreet impeccable service and warm Jamaican hospitality. This legendary hotel has managed to maintain its timeless elegance without seeming dated or old fashioned. On the contrary: this private resort now has even more comforts and the new concepts in the restaurant and spa make it more extraordinary than ever. Numerous business, political, entertainment, athletic and cultural celebrities have spent glamorous and carefree vacations at Round Hill Hotel & Villas since opening in 1953. Originally the private haven of style icons such as Noel Coward, Babe Paley, Cole Porter, Grace Kelly and Jackie Kennedy, this fabled boutique resort property comprised of 27 private villas, a 36-room oceanfront hotel, spa and exquisite dining feels like a charming, comfortable and family-oriented private club. Round Hill's old world glamour is set amidst a lush tropical backdrop where everyone is made to feel right at home. The pleasant, year-round tropical climate makes it possible for guests to spend the majority of their time outdoors. Round Hill's privacy, refinement and warm Jamaican service continues to be a haven for a long list of today's icons and tastemakers. Round Hill is privately-owned, and run as an unusual blend of a Club and a resort, directed by a Chairman and a Board of Directors elected from the shareholders. Management is headed by the Managing Director. The hotel operates year round with a full time staff of 220, about 160 of them having served Round Hill's guests for over 15 years. Before 1989, Round Hill Hotel and Villas was open only during the winter "season". Pros: Classic, elegant architecture--has an "estate" feel. Lovely location on a protected cove, with terrific snorkeling. Great restaurant on the patio overlooking the water. 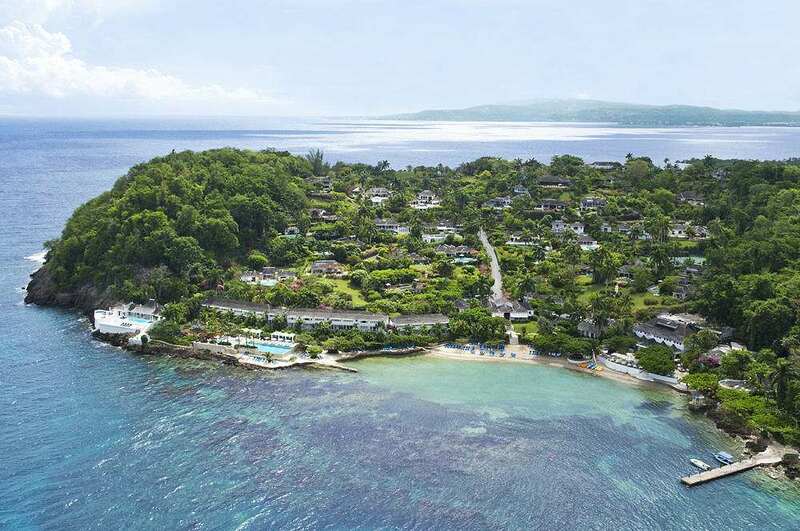 Isolated from the busy center of Montego Bay, and away from the airport, but really only 15 minute drive from anything you want to get to in that area.